fans into a polka frenzy. It’s an accordion! It’s a trumpet! It’s Oktoberfest Man! 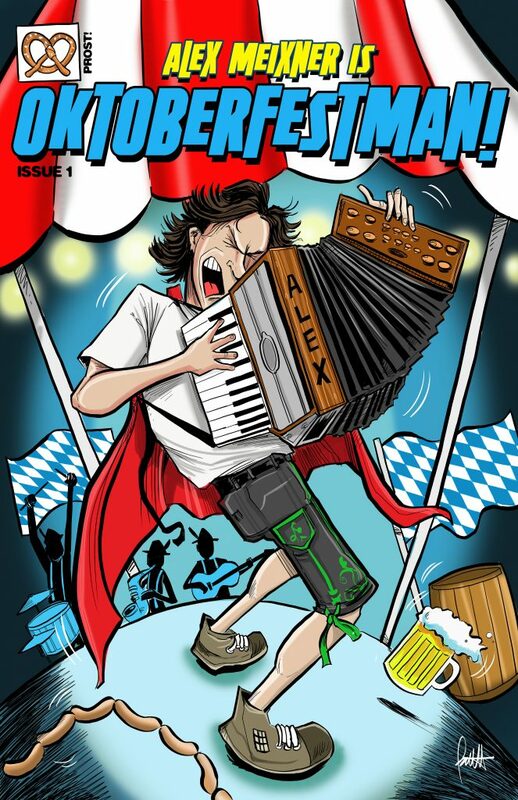 Alex will once again be at Wurstfest (Nov4-13), ending a seven-week Oktoberfest tour with stops in Ohio, Oklahoma, El Paso, Wisconsin, Missouri, Pennsylvania, New York, and New Jersey. The merry band features Hank Guzevich, trumpet; Joe Tierney, sax; and Ed Klancnik, drums. They’ll be joined at Wurstfest by California accordionist Mike Kramer, and bass player Shawn Hart, originally from Wisconsin, now living in New Braunfels. “Shawn was deported from Wisconsin for being lactose intolerant, and now he’s living out every musician’s dream of playing in a polka band,” Alex said. Alex said he loves Texas fans. “When I play in Texas, you have those audience members who have grown up with this music, and those hearing it for maybe the first time. I love to build the bridge between both of those populations. Brave Combo blazed the trail for that in Texas,” he said. Since last we saw Oktoberfest Man at Wurstfest 2015, Alex has been on some awesome adventures. He signed on as the one-man pep band for Hormel pepperoni, filming TV and Internet commercials in LA. Alex jetted to New York in July to spend two days recording with Jack Black for the movie soundtrack of The Polka King. It’s the story of Pennsylvania polka legend Jan Lewan, who developed a plan to get rich that shocked his fans and landed him in jail. Now out of jail and working with Jack on the movie, Jan called Alex and asked if he would bring his accordion to the recording session. Alex said working with Jack was a hoot. “Jack does all the vocal parts and he’s a tremendous musician and singer. You would think he’s a native Polish speaker. It’s awesome working with people like that who are extremely talented and authentically themselves.” The film is expected to be released in February 2017.
been born and named the Alex Meixner Polka Pilsner. beer. You want to have a few, dance, have a good time, and still have control of your faculties. You can indulge and not die thirsty,” Alex explained. Right after Wurstfest, Alex and his merry band will join the Jodie Mikula Orchestra and Dujka Brothers on a cruise. “We have over 150 cabins booked. There will be lots of great fellowship and jam sessions,” he said. Stay tuned for what 2017 has in store for Oktoberfest Man!